With the countless atrocities and harrowing losses the War Doctor has witnessed, his world-weary but honourable nature as he tries to remain true to himself against increasing odds is constantly put to the test, but when he witnesses the truth that rests upon an isolated world where technology is in flux and time has become a weapon ravaging all who live and die in an everlasting war, even he will be shocked by the true nature of his supposed allies and enemies alike. The one aspect that the series has not quite decided upon- and this is not a fault as it mirrors the very conflicted nature of the War Doctor himself- is whether to commit to this man as a figure who will act as the Doctor always has or as one who will go down the necessary path even if it that means a darker journey with an outcome that may be less than ideal. Here, Ollistra proclaims that he is the former, and the game of cat mouse that results between the two as the Doctor plays the role of prisoner to perfection while falling victim to a very different deception that strikes at his inherent need to help those suffering is superb. While to Ollistra the Neverwhen Flux represents the best chance at victory with resurrection on an immense scale that dwarves the Technomancers’ efforts, to the Doctor it represents a fleeting chance at redemption in his own eyes, though he realises all too well that he can no longer afford to mix sentimentality with practicality. The very notion of a War Council being established on the traditionally non-interventionist Gallifrey is extremely telling in its own right, and perhaps it should be unsurprising that by this time the Time Lords in general have sacrificed the core principle of caring about consequences in their pursuit for victory. Regardless, the Neverwhen Flux is a wonderfully visual idea that taps into the vast scope and mythology of the Time War perfectly. Deployed by the Time Lords over a world hosting an immense skirmish with countless Time Lords and Daleks alike, the Neverwhen Flux sealed all of the combatants together and subjected them to a random passage of time in which technology and physiology can be endlessly rewritten with devastating effect, and Ollistra intends to deploy this horrific weapon over Skaro to trap the Daleks and prevent them from ever mounting a force capable of instigating and sustaining the Time War. This is a fascinating concept that speaks to the true dearth of morality this setting has caused while exemplifying the extremes in technology initially promised, and ‘The Neverwhen’ manages to very much focus on the internal struggle of the Doctor as he so desperately tries to remain true to himself when presented the opportunity to help a group in need, even if that group ends up being a distinctly different one than he initially set out to help. 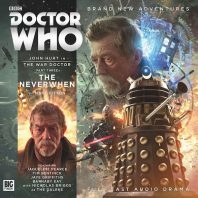 ‘The Neverwhen’ is easily the strongest entry in Big Finish’s The War Doctor saga yet, showcasing the fluidity of time as a weapon and for the first time truly giving a visual fitting of the horrors discussed with such devastating emotion by future incarnations. With plenty of time for meaningful discussion and debate as the complex relationship between the Doctor and Ollistra continues to develop to marvellous effect and as the Doctor firmly proves just who he is at this time, the simultaneously nuanced and bombastic plot anchored by a superb twist ends Infernal Devices on an undoubted high and represents a new standard for the plots and imagination within this enthralling range as John Hurt, Jacqueline Pearce, Nicholas Briggs as both Daleks and director, and the sound design remain as strong as ever and the inevitability of the Moment approaches.